He has a great bedside manner, and treated me with kindness (the type I would expect of a physician speaking toa patient he'd known for years - even though in my case, it was my first visit). He was also thorough, professional, knowledgeable, and took the time to listen to and answer my questions. He has a great bedside manner, and treated me with kindness (the type I would expect of a physician speaking to a patient he'd known for years - even though inmy case, it was my first visit). He was also thorough, professional, knowledgeable, and took the time to listen to and answer my questions. Great bedside manner. Dealt with my chalazion in a straightforward manner with very good communication. Full eye care from eye glass/contact lens to Lasik, glaucoma and Oculoplastics. 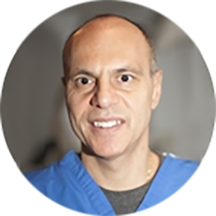 Dr. Anthony Curreri graduated in 1991 from SUNY Downstate Medical Center College Of Medicine. He has special expertise in 2 Areas, including Anterior Segment Surgery and Refractive Surgical Procedures. He is also affiliated with 6 hospitals including St. Luke's Roosevelt Hospital/St. Luke's Hospital Division and SVCMC St Vincent`s Hospital Manhattan. He and his amazing staff are looking forward to meeting their new patients! Doctor is great but the prices they bill the insurance is high. If you have mediocre insurance and need to meet deductible, I would think twice about coming here. Office manager did not budge about discounting the medical bill despite patient’s difficult financial situation. Probably the worst doctor I’ve experienced in my 59 years. Genuine doctor, very personable and efficient with his time with me. Identified my stye infection and even helped me remove the remaining gunk that was inside. It was painless. I was really happy with my first experience! Wait time was only 15 min. Dr. Curreri is excellent, and his staff is professional. The waiting room was overloaded with patients, however I think that speaks to how much people like him. Once in the exam room, he is clear and compassionate, and never makes youfeel rushed. I highly recommend Dr. Curreri, but bring a book to read while you wait to see him! Dr Curreri is ok, seems knowledgeable but very rushed, which is frustrating considering the wait times in the office every time I went were about an hour and I believe all were before 9am, so I can’t imagine how far behindhe gets later in the day. His treatment plan did fix my problem but he barely examined my problem eye and didn’t even look at the other one despite prescribing medicine for both. It worked, so call it experience I guess but I would have felt better if he had like really checked my eyes out. After a couple follow up appointments I ultimately ended up going to another doctor with shorter wait times and more advanced diagnostic machines for my remaining follow ups because the thought of wasting another hour of my life waiting around in a very dingy office to receive less than 5 minutes of care just didn’t seem worth it. Staff is friendly and helpful. And like I said, his treatment did work. He’s not bad, I really just think he needs to take on far less patients and upgrade the office a bit. Dr. Curreri is an excellent doctor. The exam was very thorough, and he answered all my questions. The staff is very friendly and helpful. I had a waiting time of 30 minutes, but then I was treated directly by the docter without doing eye exams (which I did just a few weeks ago). He was also really friendly,talked to me about my diagnoses and explained know to treat it. He seemed very competent to me. Professional and courteous staff. Doctor seemed very knowledgeable and friendly. Definitely recommended. The eye Dr.Curreri,M.D. Ophthalmologist. My visit was very B stress. Grate visit. Everything is grate. I am very appreciative. Thank you. Be blessed.????????????? He is about the third Doctor i visited and I wanted to drop everything i am doingand go back to medical school for MA/ codeing/billing. I keep asking myself in my young old age young could i? Happy Thanksgiving. Be loved. I have been a patient of Dr. Curreri for many years, he has always greeted me with patience and understanding. I wouldn't change a thing. I'll admit there's a bit of a wait, but he's worth it. No unnecessary tests... Answers to all my questions, with precision and real explanation. He is super kind and helpful! I've seen Dr. Curreri for many years and he is always professional and positive. The wait was just over 30 minutes, but worth it to see a doctor you trust. I thought he was very helpful and got right to business, without being cold. Easy to chat with and he seemed happy to talk me through his diagnosis and recommend a comprehensive treatment plan. Will definitely be back to see him! A bit of a wait (35-40min) but staff was responsive when I inquired about the wait. Doctor was quick but listened to my issue and was efficient. I like that he recommended a supplement for an issue rather than throwing surgical procedures at me as many doctors due. The wait time was very short and the doctor quickly diagnosed something that a previous doctor missed. Was very happy with the visit and treatment plan. my visit to see Dr. Curreri was great. There was no wait when I arrived for my appointment (around 11am) and I could tell that the doctor really cared about addressing my issues. He is an excellent Dr. Only downside is that his waiting room is often very crowded. The doctor was very personable and helpful. Took the time to listen to my issues and gave a thorough explanation and course of action. Very impressed. The doctor was thorough and had a good bedside manner. Easy to make an appointment with online. Have been seeing Dr. Curreri for nearly 15 years. Great staff and bedside manner. Have recommended many friends and colleagues over the years. Professional, caring and generous..definitely would recommend. Great experience. Thorough exam and recommendations. Very pleasant and easy to talk to. Would highly recommend Dr. Curreri. I thought Dr Anthony Curreri was super helpful, warm, and knowledgeable. He advised me on my eye issue and made great suggestions for next steps forward. Great! Doc was able to finally tell me what was wrong with eyes and prescribe me medication for my eyes that made my symptoms go away! Office is in serious need of an update but Dr. Curreri was fantastic! Dr. Curreri did a great job teaching while diagnosing. I highly recommend! Dr Curreri was very accurate in his diagnostic. He is a great doctor and I highly recommend him. Staff was great, attentive and very accommodating. Dr. Curreri was attentive and addressed all of my concerns.